Until moving north, fall meant only one thing for me – football – and this was all that was needed for the season. And already, the games have begun with the season is in full gear replete with significant upsets. But now there is more to the season. Just walking the dog reveals that the leaves have begun to turn as many revert to their true colors – brilliant orange, yellow and red – all while the temperatures drop and the air cools. It won’t be long before the Evergreens are our only source of color on the landscape, as most trees will shed their dry leaves for winter. Fall has become a time of beauty as well as one of excitement for me – I love it. And what I’ve learned is that this store of information has a place. It is the well I need to draw from for living Christianly – a knowledge base that I have fed over time, and had integrated over a span of experiences. I look to what I have learned in God’s Word, what I have internalized in studying what others have written from their reflections on the doctrines of our Faith, and from what I have observed in the lives of faithful brothers and sisters in Christ. But what I have discovered is that without a consistent life of Renewal, something not good happens with this information (pardon the poor grammar but this is the only way I am able to articulate what I mean): What I know easily passes into pride in what I know. What I have learned subtly becomes my foundation for seeing myself in a superior role to others who wrestle with faith and life as opposed to seeing myself through the work of Christ on my behalf. If I am not careful (and often I am not), I begin to rely on cold theological/doctrinal ‘handles’ – almost as a buffer against living passionately and imperfectly within my very human skin as a Christ-follower. In fact, I have to be encouraged that this was the life of a disciple who followed Jesus – it was all there to be seen – good, bad, ugly and in between – because that is the reality of real relationship. 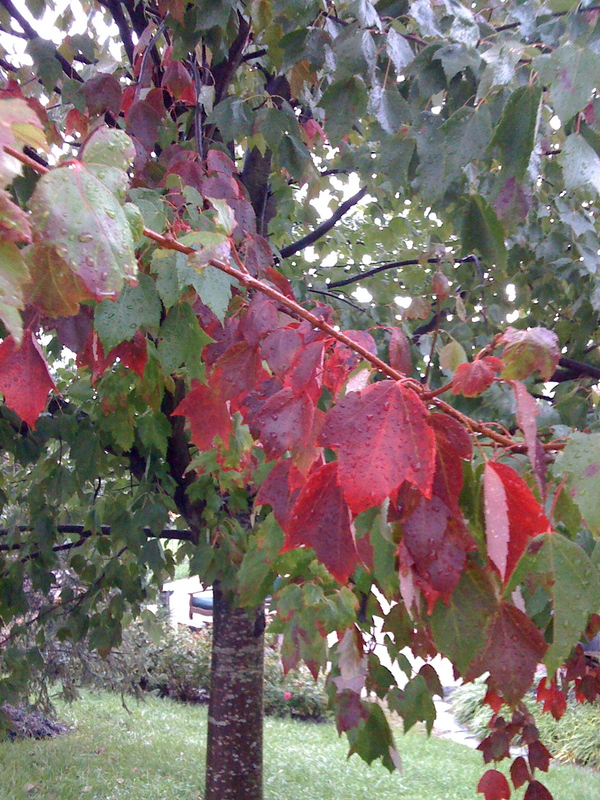 This new fall season is instructive for me – Every year the trees on our block grow. They grow up and they grow out – but this is hardly detected. What we notice is what we see and what we see is that each fall they shed their leaves. The falling of the leaves doesn’t impede growth – it enhances it. Paul, the apostle, offers that he ‘dies every day’ (1 Corinthians 15:31) – He is speaking to the practice of self-denial – that counter-cultural, daily work of Renewal (another word for growing in humility and character by constantly starting over) that comes through the Christ-follower’s willingness to be scrutinized by the Gospel and brought to a place of Repentance – not once, but constantly. I have found that it is through this excruciating, yet liberating activity that God protects me from using all that information as a stockpile that enables me to insulate myself from the very scrutiny and the very intimacy I desperately need in the journey. I think that *this* is a foundational sin in most of us: we forget that the life of a Christ-follower is one of daily death. We die because, paradoxically, to die to Christ–day by day, moment by moment–is the only way to life. And that life is not just in the hereafter but also daily and in the moment. Thanks for your reflections. I think I’ll share it with my family tonight. I love the doctrine so much. And I’ve come to realize that I’ve been given a gift to understand it, on an intellectual basis, at a level that not everyone does. That’s not prideful – or it shouldn’t be – it’s just the nature of my gift. That’s as compared to others who have a lesser ability to wrestle the theology into place but – for example – a greater capacity to show compassion, or to feel another believer’s need, or to smile encouragement through a crisis, or – the one I really envy – literally to sing His praises. My gift is what it is. It is what God has pleased to bestow – certainly I shouldn’t be ashamed of it. But just as you write, it is easy to slip into pride, and to attribute to the power of one’s own mind what one knows, really, through the intervention of the Holy Spirit. Maybe that’s true for all our gifts, but I think this one is especially vulnerable to that twisting. Recently I was in a deep discussion with another believer over a particularly thorny passage from the Westminster Confession of Faith. [I love the language of that centuries old document, and eschew the “modern versions” – which tells you something right there. I read that dense text and the meanings stand out proud from the page like raised letters. It is a gift.] My role was to explain something not grasped by this other fellow. I tried to do so, even with some humility, I hope, but certainly pleased to be the teacher and not the student. Then this believer blew me away: Out of nowhere he sincerely and tearfully apologized to me for an offense now several years old, which forced me to examine the question of my own deep-seated grudges toward him. No question, I understood Chapter III.III better than he did. But right at that moment, he had a firmer grasp of the Gospel by far. You are currently reading Fall: thoughts on a renewed life at unfinished1.